The Power Map team is excited and proud to bring you the April update of Microsoft Power Map for Excel. This update brings new functionality to Power Map and improves some existing features. Power Map users with an active Office 365 subscription will receive this update through Office 365 Click-To-Run if they have automatic updates enabled. Based on feedback from our customers and community, the Power Map Preview add-in will no longer expire on 5/31/2014. We will make this add-in available for all versions of Office 2013 and Excel 2013 standalone. Please note preview features are not supported and we do not encourage the preview version be used in production. A supported version of Power Map is available as part of the Office 365 subscription today and only supported versions of Power Map will receive feature updates moving forward. Power Map will also be added to Excel in the next version of Office for customers purchasing Office under a perpetual licensing agreement. The extended Power Map Preview add-in will be available on the Download Center in May and we will announce availability on the Power BI Blog, Office.com and TechNet. We thank you for your feedback and usage of the Power Map preview. While Power Map recently added the ability to export your tours in the form of a video, there was no easy way to add a soundtrack to the video. Usually, you’d need to download some other software and add it yourself, which wasn’t much fun. We noticed many of our users were sharing their videos online, but like silent films, they had no accompanying soundtrack. While we love The Artist as much as the next person, we think adding sound to your video makes it more powerful as a story-telling tool and should be something you can do from right inside Power Map. In the April update, we launched a new feature that allows you to add audio to any tours you export as video from Power Map. Simply choose an audio file from your computer and we’ll add it to your Power Map video. We also offer some convenient features to make your audio file a perfect fit with your Power Map tour. 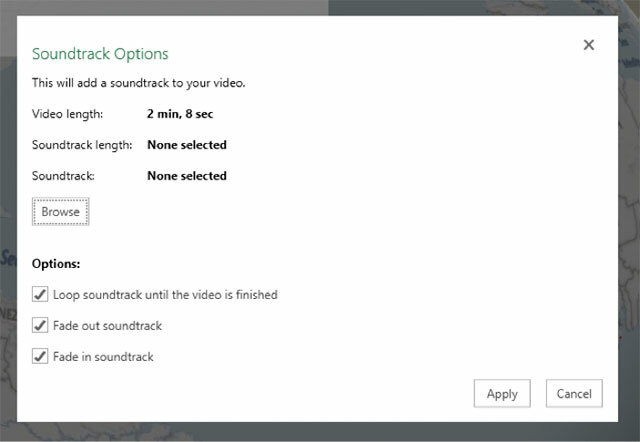 For example, you can easily see how long your soundtracks are and choose one that matches the length of your video. Don’t have a soundtrack that fits perfectly? No problem, as you can let Power Map loop the soundtrack for you. Power Map can also fade the soundtrack in and out for you to provide for a gentler introduction and closing. That’s all you need to do to add sound to your Power Map tours! It’s that simple and, best of all, you can do it all from within Power Map. We worked with the Bing team to provide a more accurate geocoding of major cities worldwide when there are no other geo-fields in your data. The improvements will be apparent if you have ever tried to geocode a city like ‘Paris’ without ‘France’ in the same row. This type of geocoding is now orders of magnitude better than what it was before thanks to some very interesting work in complex disambiguation and ranking algorithms done by the Bing team. In addition to these two features, the April update to Power Map also features a collection of bug fixes and performance improvements. We’re always working hard to improve Power Map, and you can help us by providing your feedback. If you have a feature suggestion, comment, or question, let us know on the Power Map forums, or through the comments section below. We’d also love to see any videos you’ve created (with and without sound), so share them using the comments section!